Bus – There are bus services and rideshares from San Francisco Bay area with varying schedules and pick-up times. AlterNetRides is a website that coordinates rideshares, and California Tours offers an inclusive Lake Tahoe Bus Tour Package. Additionally, you can also call your resort in advance to see what shuttles they offer from Sacramento, Truckee, and Reno. 3. Skiing there: With 40ft falling per year, the snow in Tahoe is the main winter attraction. There are three major ski resorts in the South Shore. Heavenly Ski Resort has the largest ski area and according to Ski Report’s Site it is the 2nd mos t popular one in the US. The other two resorts are Kirkwood and Sierra-at-Tahoe. All three offer diverse slopes to fit skill levels of beginners, intermediate, advanced, and extreme terrain. If you are showing up sans equipment, no need to fret. You can rent skiing and snowboarding equipment on site (or offsite if more convenient) and even take instructional lessons if needed. 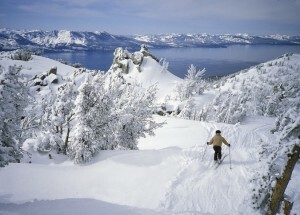 For a complete listing of ski resorts, please visit Tahoe.com to see which resort is most appealing. For any additional information, please visit the Official Lake Tahoe Visitor Bureau Website. Also, don’t forget to check out California Tours’ Lake Tahoe with Heavenly Ski Resort package that includes transportation, accommodations, ski lift passes, ski rental, and more!